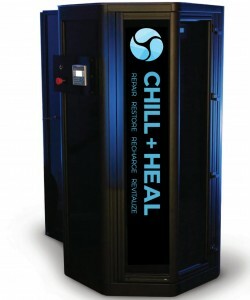 At the core of what Chill + Heal offers is the Whole Body Cryotherapy (WBC) treatment. CHILL whole body treatments are two to three minutes long and consist of immersing the body in a cloud like mist of air that has been cooled to temperatures in the range of -202 degrees Fahrenheit. Our trained therapist is present while the treatment takes place to ensure that the experience is comfortable. Clients have stated that Whole Body Cryotherapy prompts a number of positive reactions in the body including: improved and deeper sleep, increased energy, a metabolic boost, and a release of “happy” hormones like endorphins and adrenaline. We exclusively use the Impact Cryotherapy™ Cryosauna, the only Cryosauna MADE IN THE USA. Impact Cryotherapy™ offers the most advanced whole body cryotherapy system available worldwide. Dr. James Andrews, a well respected orthopedic surgeon and one of the founding members of the American Sports Medicine Institute has come out in full support of Whole Body Cryotherapy. He is also the chair of the national advisory board at Impact Cryotherapy™. The difference that separates an Impact Cryotherapy™ cryosauna to other cryosaunas include: MADE IN THE USA. The multi-pressurized spray jets that a create 360° full body immersion effect that eliminates uneven cooling. Dual zone sensors in the cooling system provide accurate, consistent temperatures that can be reproduced session after session. No wooden structural components means no severe contraction or brittleness at extreme cold, so no drying out time between sessions, or ongoing wood maintenance requirements. The unique cover allows the head to remain above the chamber and contains the cold air for maximum cooling results.